Spread the Love Heart Succulent Garden is a wonderful way to celebrate any of life's occasions, big or small. 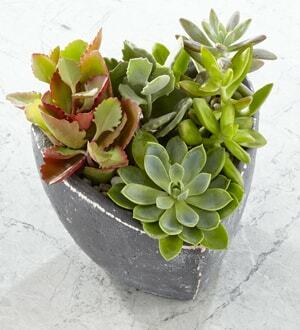 Arriving in a heart-shaped container, 6 assorted succulents, displaying various textures and shades of green, are planted together to create a long-lasting and innovative gift your special someone is sure to admire. Ready to be set on a coffee table, desk, or side table, these succulents are set to create an inspired Mother's Day, thinking of you, or happy birthday gift.